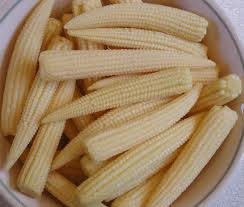 Baby Corn is so versatile that it can be used in making starters or main course.. Here is a simple and quick way to make a yummy snack with minimum ingredients and time! Take a bowl and mix the corn flour, all purpose flour 2 green chillies [finely chopped or paste] salt to taste. Batter should be of medium consistency not to thick nor thin and should nicely coat the slit baby corns well. Deep fry the babycorns and keep aside. Take a big wok/ kadai and add a tbsp of oil add chopped onions which is cut length wise also add the ginger garlic paste, fry it on a high flame until the raw smell disappears. To this add the chopped tomato and fry well add the tomato and soy sauce also the vinegar. Add the fried baby corn and mix well and flame should be high this will make the corn crisp keep tossing it to avoid burning. finally end it with chopped spring onions and coriander finely chopped. Serve hot as an appetizer with some ketchup.